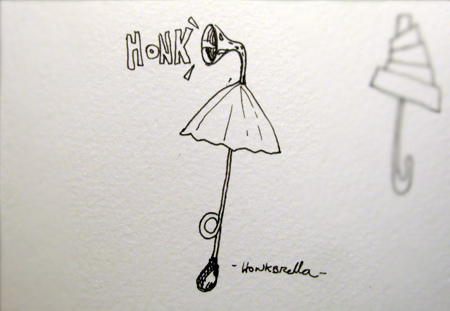 Posted on March 12, 2011 February 4, 2012 Author DrewCategories Uncategorized1 Comment on Honkbrella! 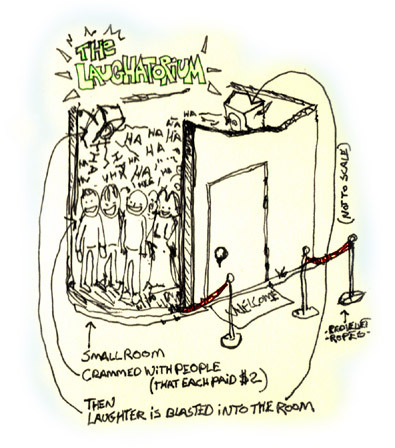 The Laughatorium, is a small room where you cram a bunch of people into it, then blast them with laughter. I’m not sure what is supposed to happen next but, I can assume that some of the people in the room will start laughing then soon the whole crowd will be laughing. At some point the laugh track will not be needed at all. Perhaps the idea of this small room crammed with people will be the kindling for this blaze of laughter. Apparently this idea is not new, it was shared to me by Allegra, who heard it from some South African man who said these “Laughatoriums” are all over South Africa. I did a little research and couldn’t find any information on these things. I might look into this more if I have some time. The idea is really awesome. I could see several uses for these little rooms. Making it portabler would allow you to visit large corporations who like to spend money on “team building” exercises and stuff like that. Perhaps laughter might be more popular than a cup of coffee in the morning. Perhaps pumping a little more oxygen into the room might help people get some good laughter going. It also might be nice to have some funny or interesting drawings inside the room to really add to the experience. The Laughatorium might also serve well as a promotional piece. I think it might be worth building and setting up downtown. There must be numerous health benefits to this sort of device, I guess we won’t know until we build it and test it on people. Ha Ha ha ha ha ha ha ha ha Ha Ha ha Ha ha Ha Ha ha Ha ha ha huh HA HA Ha ha ha ha huh. Posted on December 28, 2006 May 20, 2012 Author DrewCategories Uncategorized5 Comments on Laughatorium! 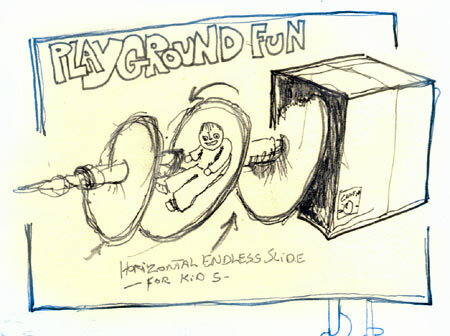 A long time ago I had a wonderful idea for a piece of playground equipment, an Endless Slide! Despite not being able to find the original pages of notes and drawings on the idea I drew a rough spec so you can visualize such a fun piece of equipment. Obviously this drawing is not to scale but you can get the idea. By having a longer rotating slide unit more kids could enjoy this slide at the same time. Slouching is a major problem now-a-days. More and more people have poor posture. I try to hold the sky up with my head but, if I’m not thinking about it I often end up slouching. I’m 6’4″ and it’s easy to forget what I learned in posture school. Recently I ran into my friend Kim who pointed out how poor my posture actually was. I should point out that she has very good posture. I also realized that successful people generally have good posture, this formula will also work in reverse so… Successful People = Good Posture so Good Posture = Successful Person. This simple math problem shows up that if you want to be a success, good posture is the way to go about it. The secret to good posture is this hat. Now I’m no haberdasher but, I certainly think this hat could be stylish and practical. Since my formula proves that Good Posture = Success then, if this product ever gets made it’s certainly worth a fortune. The high tech design of this stylish hat promotes good posture for those wearing it. 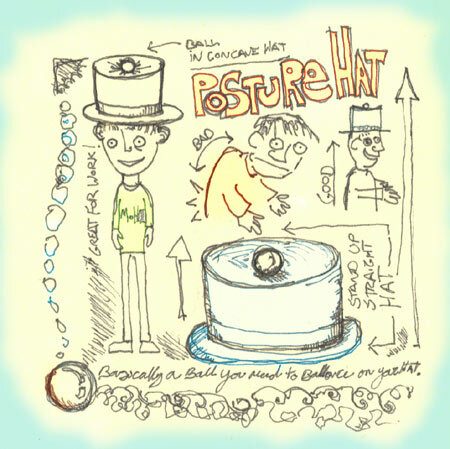 By simply balancing a small ball on top of the concave hat you are encouraged to stand up strait. I do hope we can build some prototypes for these hats soon. Any large office should encourage workers to wear such ergonomic hats. Even if we don’t make a fortune on these hats think of all the good we can do for all those with poor posture out there. 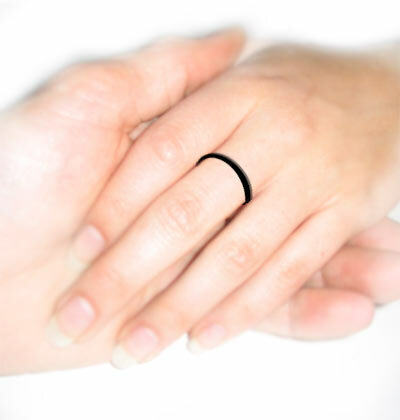 The break-up ring is a ring you give to your current boyfriend or girlfriend in order to let them know that you would like to end your current relationship with them. When you need to say something and just can’t find the words, this ring offers an easy way to share how you feel. Much like an engagement ring, except for opposite. We hope to be offering these wonderful rings in our shop soon. We might even start selling “rebound rings” and I would like some “companionship tonight rings” too. I’m sure we could come up with a whole lot of different styles and labels for the exact same ring. After a recent family trip to the San Juan Islands, I stumbled upon this wonderful Hundred Dollar Idea while riding the ferry. A brief stop at an Island my brother Aaron pointed out this wonderful site. Wow! There must be like a hundred bucks in change down there! 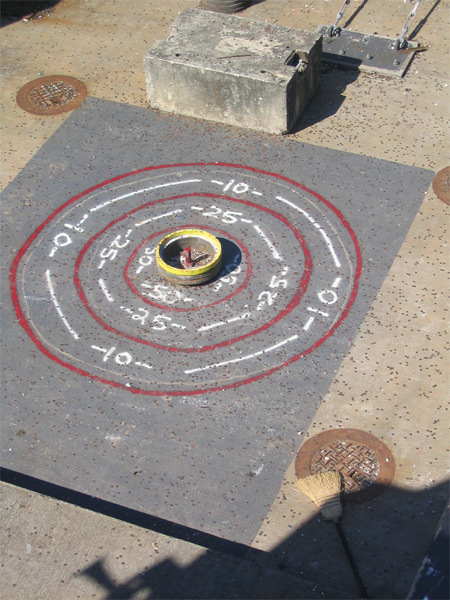 The dock had been painted with a target that encouraged people to literally throw money at it. I even saw someone try to make a paper airplane out of a dollar and throw it to this wonderful target. I figured this would be a great product to make and sell. We could even give them to the workers at busy intersections (generally they carry cardboard signs). I bet we could slap some advertising on there too. I would imagine our roll able waterproof (for fountains) money targets would be a fantastic investment for anyone who is looking to make some money quickly. After returning to Portland I decided to do a little investigation into this wonderful idea. I learned a valuable lesson about investigation. Some things are best left not found out. Here is a series of emails that I had to inquire about this money target. To protect anonymity Iâ€™ve changed some names and titles and edited some things. Originally I emailed the treasurer of the Island thinking they would be the one who managed the money target. target at the ferry dock. details on this I’m very interested. How much revenue does this target make? Do you think other islands might adopt this idea? very much like to ask them some of these questions. selling on our site soon. spend some time on Lomez. 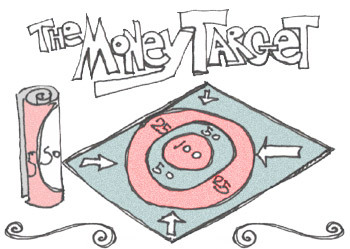 If you use such an idea as the â€œmoney targetâ€, please donâ€™t attribute it to Lomez Island. I wasnâ€™t aware of the target so I phoned the Lomez ferry dock and they are continually painting out that target. It seems there are a group of kids that periodically paint it back to life and then collect the money themselves! Clever perhaps, but not at all appreciated by the ferry system. So now you know; hopefully it wonâ€™t be there the next time you visit. inventive idea in the works. pleasure that is unique and creates a brief but memorable experience. quite savvy about such issues. Removing the target is probably going to upset some people. I think the Chamber of Commerce should consider keeping the target. you can distance yourself from this money target. will keep this target going. drive on the ferry not seeing what tourists see. allowed regardless of the motive. to have the addition of the “Charity Target” as well. wouldn’t let the Ferry System push you around. I have not heard from them since. Although not quite a hundred dollar idea. 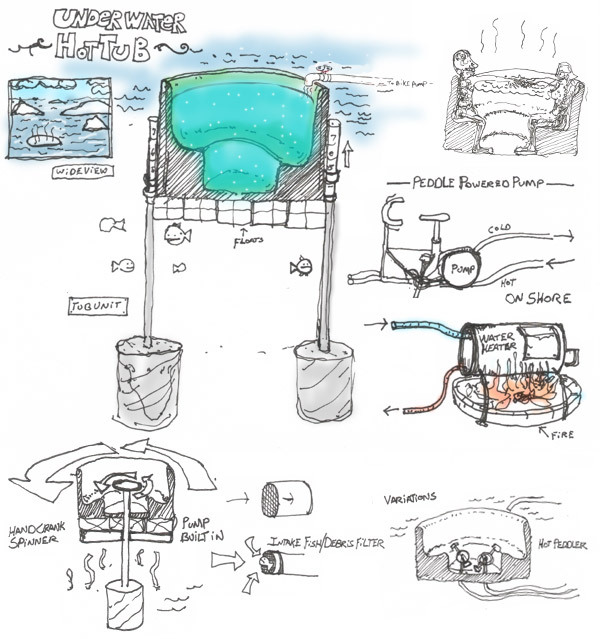 I thought there might be some parts of this underwater hot tub that could actually fit into the concept of the site. After seeing my Aunt and Uncles wood-fired hot tub I came up with this idea. The basic idea is for people who live on or near large bodies of water. Slightly offshore they could install this hot tub and be able to sit in a small body of water inside of a much larger body of water. A simple pump unit would feed the water heater and cycle hot water back to the tub. A small onshore fire would heat the device from shore or on a floating platform. I’m sure there would be an easy way to siphon water to the tub too. Built in pumps would enable people to be able to soak and exercise at the same time. Much like what PlayPumps has going on. This device is operates much like a tube of lipstick, a glue stick or chapstick. Simply insert a stick of butter into the butter chamber. Turn the butter adjustment knob to engage a simple gearing mechanism that will extrude the desired amount of butter needed. Then spread your butter easily on your favorite food items. Between eating buttery dishes, place the cap on the tube for maximum butter freshness. 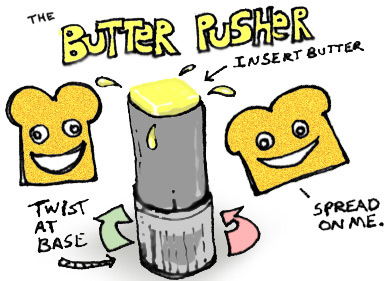 Portable Butter Pushers could be sold for the traveling butter enthusiast. Swappable rings could force butter out in a variety of tasty shapes, operating much like a PlayDoh factory. “The Butter Pusher, it pushes butter”. We will have to work on the slogan.